Clogged air conditioner drains can damage your air conditioning system, and left long enough, can cause substantial damage to your home. Your air conditioning evaporator, most of which are located in the attic of Houston homes, creates a substantial amount of water. This water is the humidity drawn from the air by the cooling process. It condenses on the cool evaporator coil and is thus called condensate. It has to go somewhere. Current installation technique uses a primary and secondary condensate drain system. 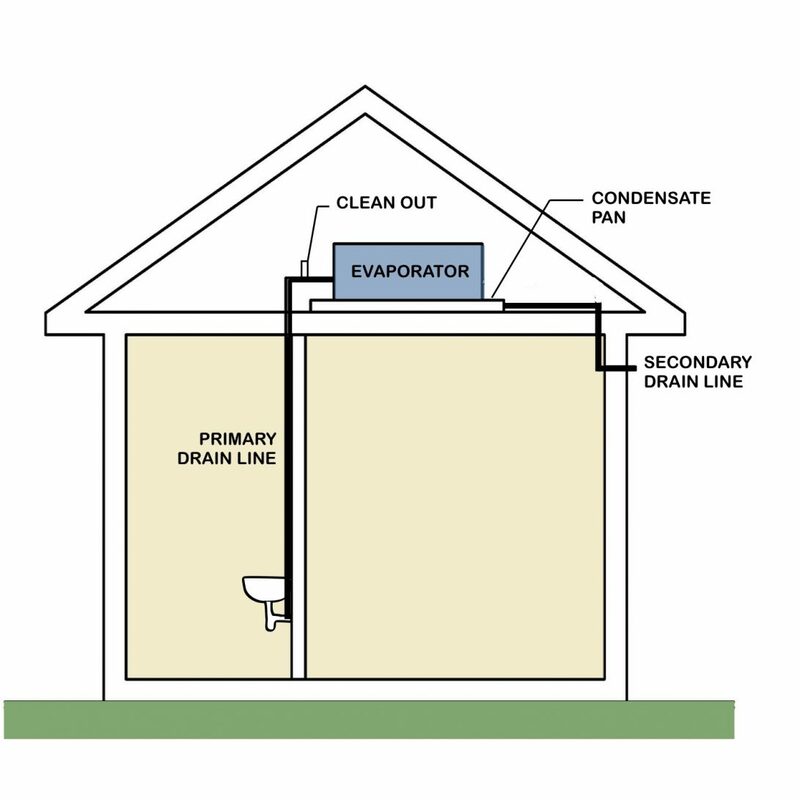 The primary condensate drain system consists of plumbing from the evaporator unit to a plumbing trap in the house, normally a bathroom lavatory. 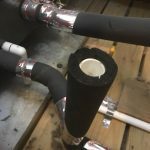 You can recognize this connection as a black rubber hose. Sometimes it is hard piped with PVC. The air from your home passing over the coil has bits of dust and organic matter as well as living organisms. This gets deposited in the water on the coil and thus into the condensate drain system. This is an ideal growth environment for all sorts of things and fresh nutrients are constantly provided by the flow of condensate. 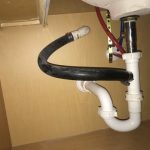 The primary condensate drain line is prone to organic growth which will clog the drain. When it clogs the water can no longer flow. At that point it is diverted to the secondary condensate drain system. This system consists of a pan under the evaporator and a drain line that carries the water outside the house. It will also eventually clog, which will result in a pan overflow and subsequent structural damage to the ceiling below the evaporator. Clog prevention of the primary system is fairly easy. All you need to do is pour a cleaning agent that will discourage organic growth down the primary system on a regular basis. I recommend, every three months, that you pour about a cup of a cleaning agent such as white distilled vinegar or chlorine bleach. If bleach is used be sure the air conditioner operates continuously for several hours after introduction of the bleach. So what does the cleanout look like? It will be either an open or capped PVC pipe projecting vertically from the insulated primary drain line at your evaporator. The cap should be removable. Don’t glue it in place! The cap reduces the cool air escaping from the system into the attic so I recommend using one. While you are up there pouring your cleaning solution, check out your drain pan under the evaporator. If there is water in it, your primary drain may already be clog or corrosion may may have already destroyed your evaporator. Don’t forget to have a trusted HVAC contractor service your system before the start of the cooling season and before the start of the heating season.